Carlos Edmunds' education includes a Master of Art in Teaching from The George Washington University, Washington D.C. in January 2017. He attended the Maryland Institute College of Art from August 2008 – December 2009 in Baltimore, Maryland and did courses and internships in teaching visual art. He earned his Bachelor of Fine Arts from Corcoran College of Art and Design, Washington, D.C. in May 2007. Edmunds is a published, and practicing studio/gallery artist who is proficient in Adobe Photo Shop, Auto-desk Sketchbook 2013 and Painter 2012-15. He is currently practicing in Adobe Illustrator, Auto Desk Maya and Adobe Flash. Shows include group show “In their Own Eyes” in October 2016 in Brentwood Maryland, Prince George's African American Museum, June 2014 and Washington DC Group show at Duke Ellington School for the Arts main gallery. "As I get older, this scripture becomes a deeper part of my everyday reality. I see these words as a hope and a warning. My fundamental practices in the profession as an artist, teacher, and parent, are bound as one. One position affects the other; they are physically and spiritually bound to each other. I have come to understand that the coexistence of different beliefs and ways of living and thinking can be enhanced through the visual image. It is important that a community understands how to perceive the world around them, and how the world perceives the community. The created visual image is a tool of permanence that can record and remind us of our history and our responsibilities to our personal and extend communities. I have practiced this philosophy through numerous art projects with much success. During my time teaching at The Duke Ellington School for The Arts, I designed and created an art space/studio surrounded by personal works of art and student work. At National Collegiate Preparatory Charter High School, for an event that consisted of a visit from the DC Mayor, with the help of my student we created a six foot tall- two hundred foot wide mural in one week. 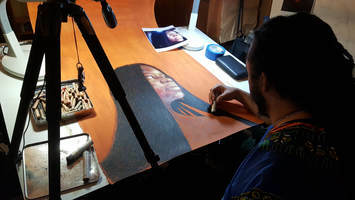 I have worked with numerous Churches in establishing art programs, and extending my talents in fulfilling arts based needs ranging from, t-shirt creation, brochure creation, and commissioned portraits. I have also worked for over 10 years seasonally within art and crafts for the special needs division of the the Maryland National Park and Planning Commission. "All of my artistic energies are used to increase and enrich the personal and extended communities that I love. I enjoy the process of time that goes by when creating for others. It gives my artwork a utilitarian purpose, where the intent and message will always be remembered . The time consuming nature of art creation, and it benefits, are process that I have always welcomed, and pursued in the art classroom, and throughout my art projects. "It is important that all minds are constantly in the process of creation, through visual experience, and art practice, guided by artist and art educators. It is my intent to create, through visual art, environments that speak for cultures. I am influenced by the idea of creating a visual environment based on the cultures existence. An environment where the art speaks to, and about, the actual life of those whom the art is for. I ultimately do this because I know that people are more than the culmination of the beliefs and fears of our cultures. I believe that art allows people to understand who they are culturally and personally, and that the art they are surrounded by becomes an extension of their inner self. I hope that you would grant me the opportunity to share my artistic skills and experience to enrich and beautify even the smallest part of our community."